"A quilt is a labour of love." Oh my, the amount of times I've heard this... And now, finally I know it to be true. So very true! I've recently become a godmother to a baby girl and I wanted to give her something special. Something made by me, especially for her. Something that would be happy and telling of how much I love her already. 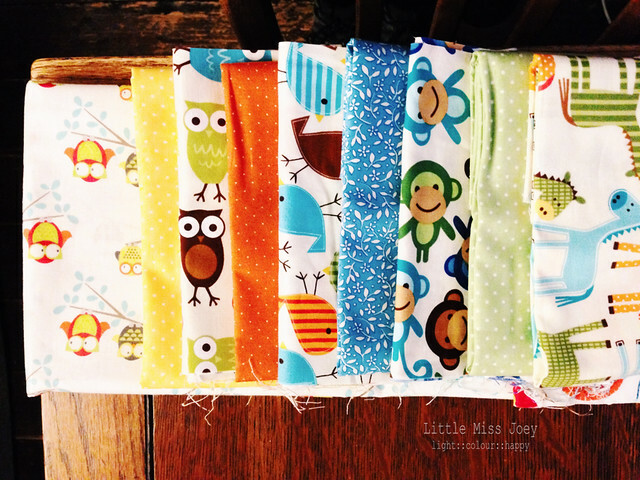 A baby quilt was just the thing! This was my first ever quilt; I had done a little patchwork blanket before, but that was about it. I learned loads! It was mostly a fun journey, with a bit of head scratching with the binding, but nothing too overwhelming. My experience was made much smoother thanks to the loveliest, most knowledgeable fabric shop lady ever, Rosie of Village Fabrics (don't let the website put you off, that shop is quilting heaven!!). In case you're interested in doing your first ever quilt, or you'd just like to know more about what I thought of it all, I'm writing a series on my process, from fabric selection to finished quilt. Here is part one. I would strongly recommend going to a quilting fabric shop near you, if you possibly can. There may not be a Rosie there, but there will be someone a bit less lovely but hopefully just as friendly who can help you and advise you. I now think of myself as an experienced sewer but I don't need to reinvent the wheel; quilting is a different sewing game and experienced quilters can give you precious tips on how to tackle your project. Rosie taught me to calculate how much fabric I'd need and how I could lay it out to keep it varied and fun. 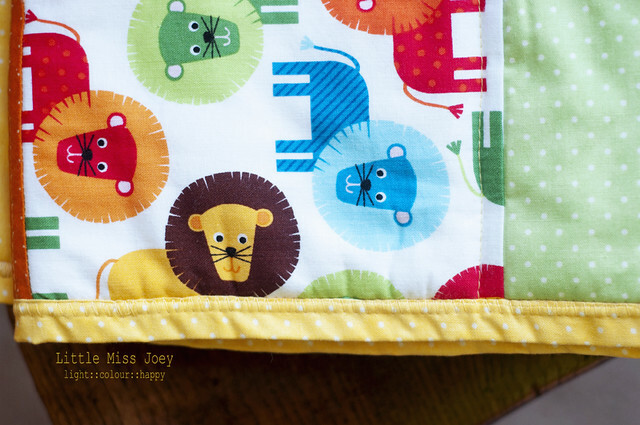 She helped me find the solid colours that best matched the animal fabrics I had chosen. She found the backing (I love that backing!!) and for that I am so very grateful to her. She told me what threads to get and how to use them. She also held my hand when I said "I really love these fabrics but they're not pastel like the other baby quilts I see... But I love these best!". "Your quilt will be just great! "; sometimes us novices need a bit of support like that. How did I choose the fabrics? Well, I wanted something with animals, that was mandatory. I wanted yellow as a unifying element and knew all along my binding would be yellow. I thought I'd find some baby fabrics, with a few animals in pastel-y colours; I didn't. Instead, I fell in love with these strong coloured oh so very happy animal prints and that was that. Once I had those, I needed to pick some solid fabrics to bring it all together; Rosie was essential in this and after a bit of trial and error, we nailed it! 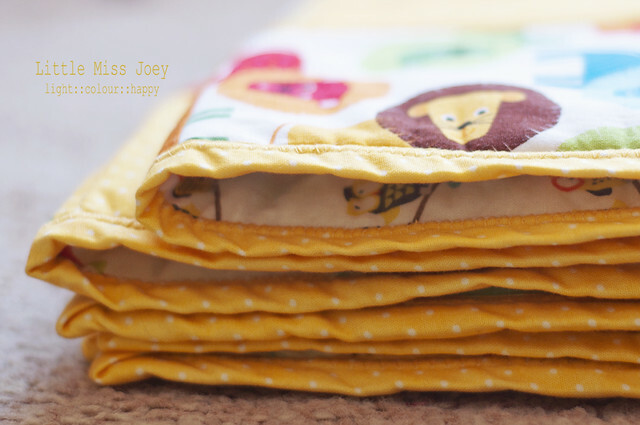 Originally, I wanted the backing to be yellow but once I saw those cute little owls I knew I had THE quilt for me. I have a cutting mat, a see-through quilting ruler and a rotary cutter. I found them essential. I also used my thread-picker quite a lot with the binding; it's the cheapest and best little thing I ever got! I have a quilting foot for my sewing machine, which was excellent as all this quilt was done by machine. It's a bit too early in my quilting obsession to do it by hand... Maybe something for the future? Copious supplies of tea, leafy red fruits. Good music or light comedies are also helpful to have in the background. Read Part 2 and Part 3 of my Happy quilt series.